Following the Space Shuttle Disaster earlier this year it was believed that everything on board had perished in the burn up however NASA revealed today that it had uncovered some survivors in the form of the C elegan Worm – the first creature to have it’s genetic code mapped. 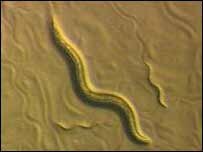 The Type C Elegan Worm was the first multicelled creature to have its genetic code mapped. On hearing the news regarding the survivors, President George W. Bush was first pleased but once he found out the survivors were not the US astronauts he immediately became concerned. Eventually, scientists managed to calm the President the worms were not hostile but he still felt they should be questioned.